A French Foreign Legion yarn in which disgraced men become heroes. 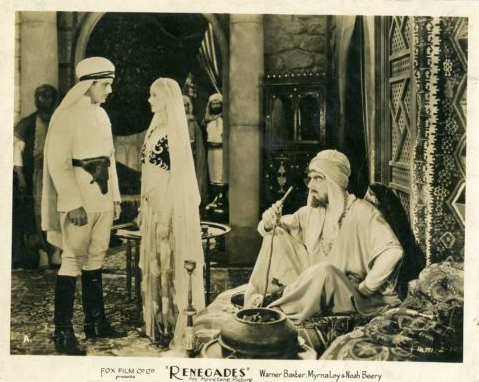 Bela Lugosi appears as a sheik. 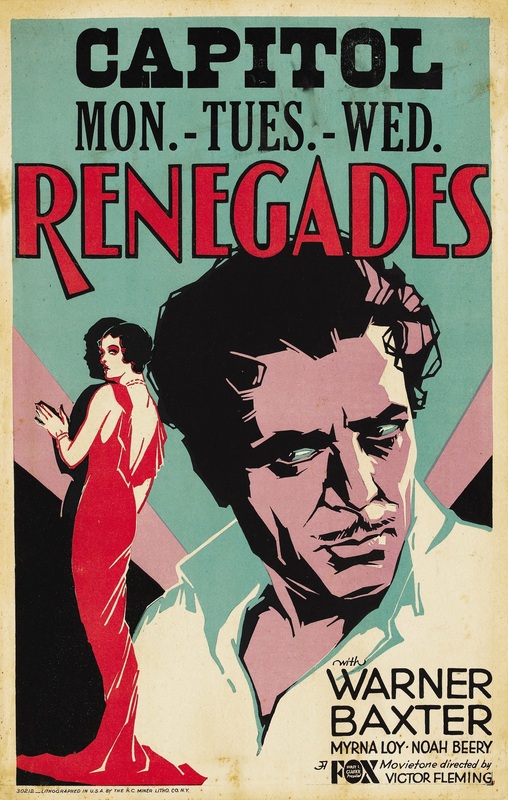 Based on the novel Le Renegat by Andre Armandy, Renegades was the second film of 1930 to feature Bela Lugosi and Warner Baxter. They had previously appeared together in Such Men Are Dangerous. Director Victor Fleming later helmed Gone With The Wind, which featured Victor Jory, and The Wizard of Oz in 1939 and the 1941 version of Doctor Jekyll and Mr. Hyde. Lugosi and Victor Jory later appeared together in another French Foreign Legion film, The Devil’s in Love (1933). Jory played Count Dracula in touring productions of the famous vampire play in the late 1920s and early 1930s. 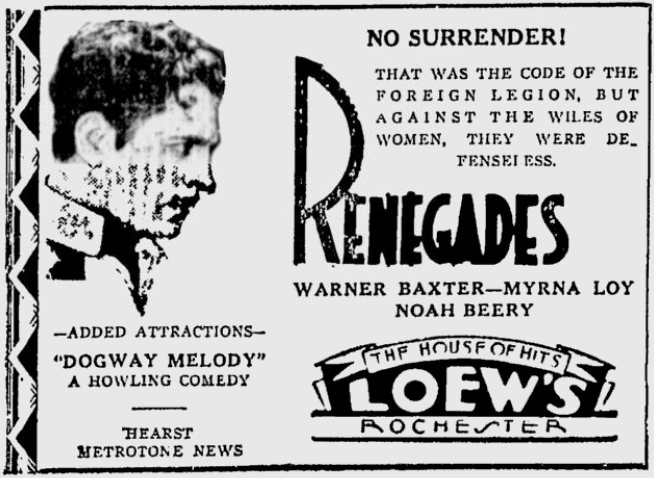 Although it is endowed with impressive desert scenes and capable acting, “Renegades,” an audible pictorial adaptation of Andre Armandy’s novel of the French Foreign Legion now at the Roxy, is a muddled and tedious offering. It is a popular type of melodrama, with occasional wisecracking from George Cooper, who plays one of four privates in the Legion. 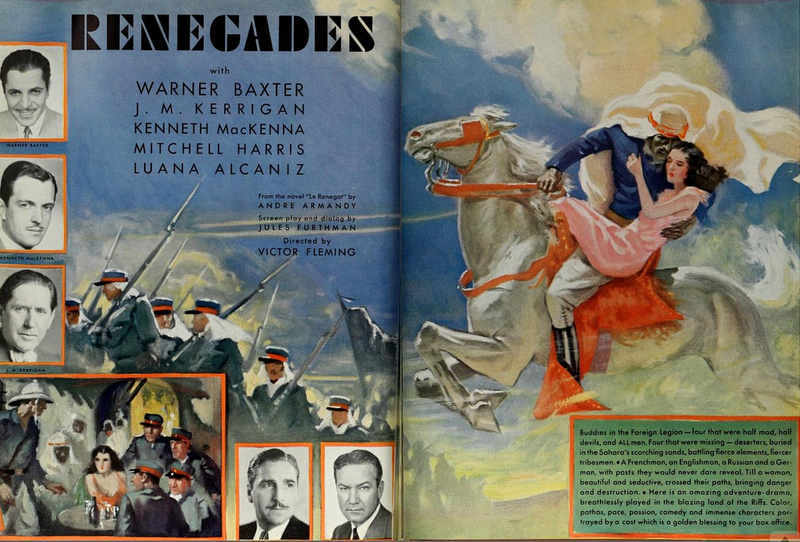 The other three are impersonated by Warner Baxter, Noah Beery and Gregory Gaye. In the beginning the quartet is in disgrace, but a little later the four men are being decorated for valor. Subsequently three of them escape and make themselves comfortable and autocratic with natives whom they train as combatants. The woman in the case is a sort of Mata Hari and is acted by Myrna Loy. Through her activities Deucalion (Mr. Baxter), a French officer, is disgraced; hence his enlistment in the Foreign Legion. This woman spy, named Eleonore, is apparently incorrigible to the bitter end. Matters are set right, however, for the four Legionaires by having them save at least some of the members of their former regiment by turning the machine guns on the forces with whom they are then associated. Mr. Baxter is excellent. Mr. Beery tackles a rôle with a German accent and his voice is too strident. 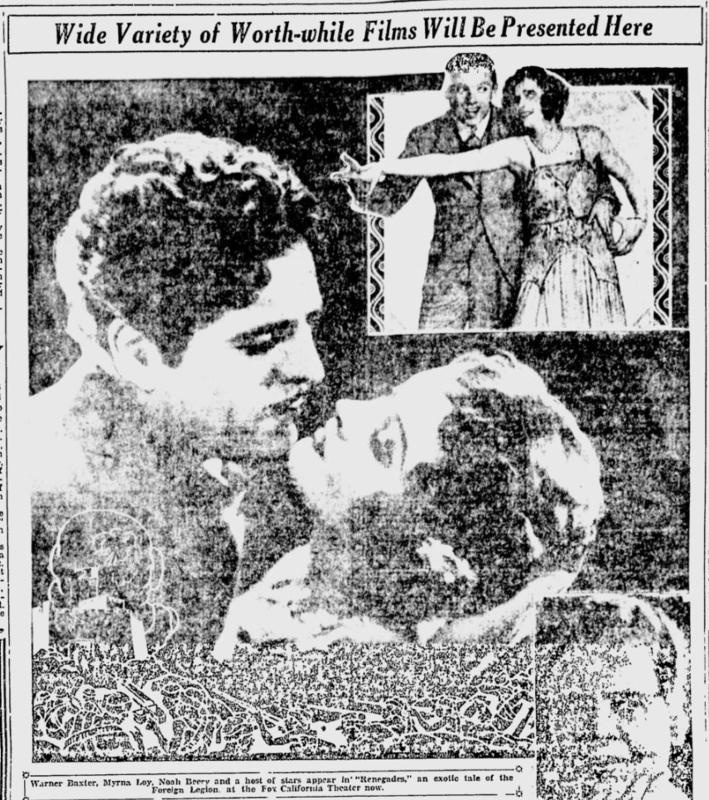 C. Henry Gordon, whose acting is commendable, also talks so loudly that it seemed as though his voice might tear the screen. Myrna Loy appears to be well supplied with garments suitable to a siren. Her acting is, however, quite praiseworthy. On the surrounding program is “Rivers of the World,” with Roland Smith, Patricia Bowman and others. The Four Legionaires. 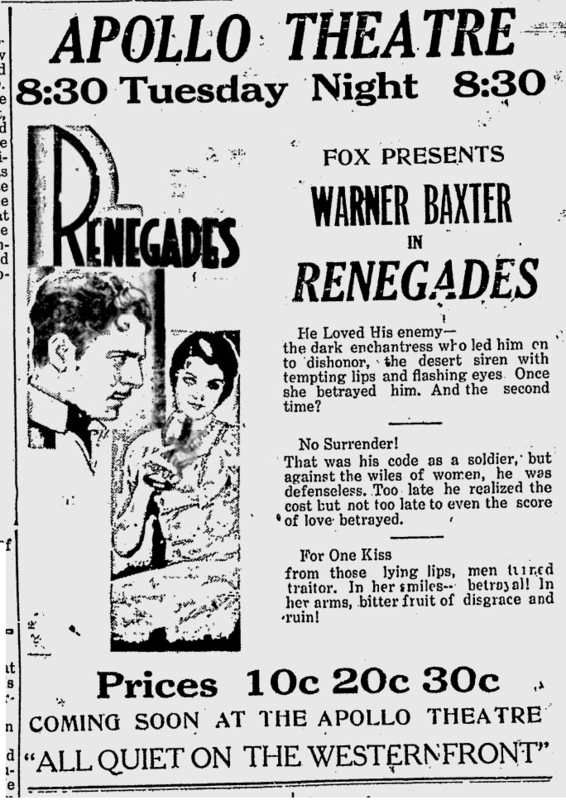 RENEGADES, with Warner Baxter, Myrna Loy, Noah Beery, Gregory Gaye, George Cooper, C. Henry Gordon, Colin Chase and Bela Lugosi, based on a novel by Andre Armandy, directed by Victor Fleming; overture, “Tchalkovskiana”; Fox Movietone newsreel; “Rivers of the World.” At the Roxy. Fox time, 1 hour, 30 minutes. 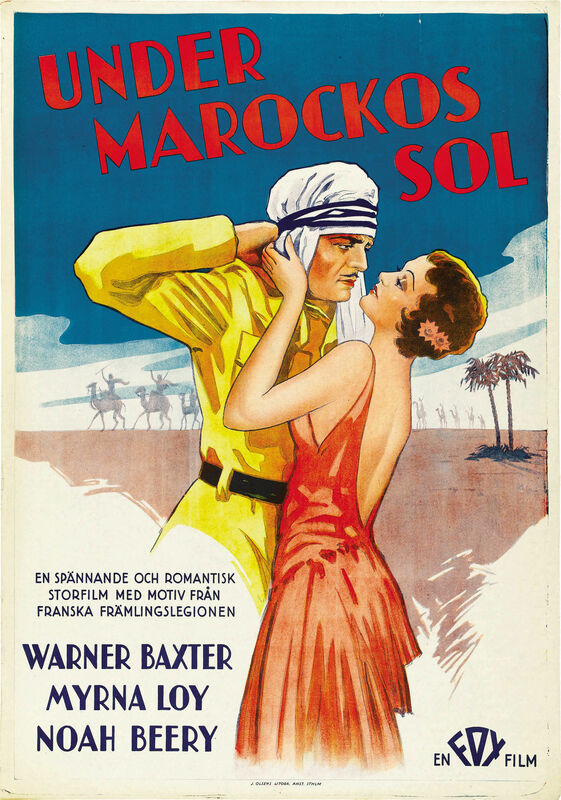 The gripping action, the story of the Foreign Legion, pack a wallop in the direction and excellent acting ACE. Victor Fleming has gone through the work of the great director in his story who carry a powerful punch at an angle a rare feminine. From the novel of the Foreign Legion by Andre Armandy, stirring completely, director caught the colorful atmosphere. The story is full of twist and surprise unusual action. There is a fight scene some great riff between the corps. 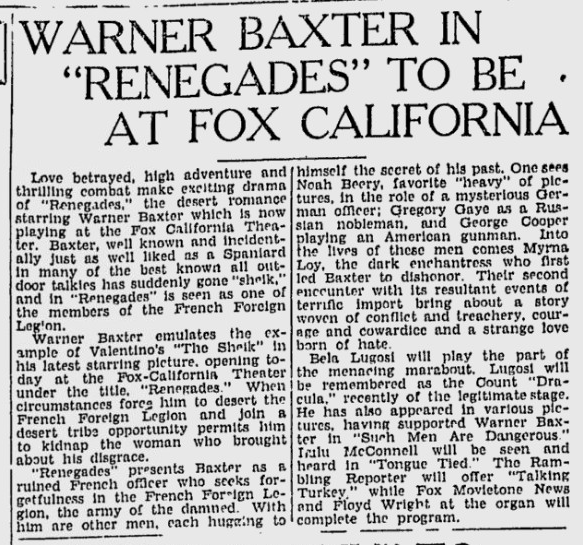 Warner Baxter will do the role large seconded by his fellow George Cooper Noah Beery, and Gregory Gate, Legion skillfully. OFT last he shake the army corps of native support in crisis participating four desert, to riff, and it, fight former associate of his. Myrna Loy to an excellent job in the powerful role of spy. 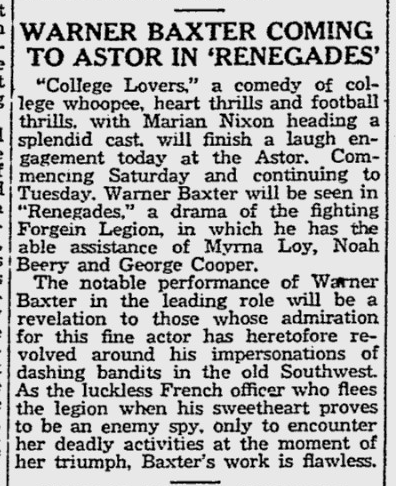 C. Henry Gordon, runs the narrow margin for the honor of Baxter Legion as captain. Is in the role of DARB, he puts it on in the punch. S stand out as a powerful Fam angle action drama about the unusual role of Myrna Loy. Director, Victor Fleming; author, Andre Armandy; people when they interact, the same;; adapter, Jules Furthman editor, Harold Schuster; photographer, William O’Connell; recording engineer, Alabama Kirbach.